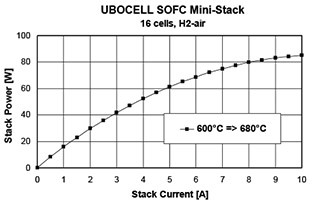 The standard UBOCELL SOFC Mini-Stack consists of 16 planar ceramic cells, metal bipolar plates, one TC bipolar plate for temperature measurements at the stack center, two end plates and four tie rods. All materials are carefully matched to avoid differential expansion during temperature cycles. 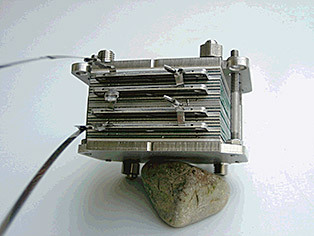 The stacks are delivered with reduced anodes. 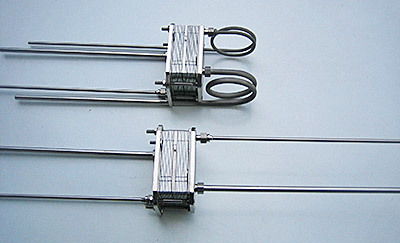 The four supply and exhaust tubes for fuel and air and miniature connectors are available. The front plate has two threaded (M4) holes for safe system mounting of the stack. Optimal flow conditions are obtained inside the stack by a double-diagonal (right to left, front to back) flow fields of both media. UBOCELL SOFC Mini-Stacks are available with two different tubing connections for convenient system integration. Top: All four connecting tubes are accessible from the front of the stack. Fuel (4 mm) and air (6 mm) are supplied to the stack from behind. Both media are preheated when passing through the curled tubing sections. The stack exhausts are located at the front. Bottom: Fuel and air are supplied from the front and exhausted at the back (or vice versa). 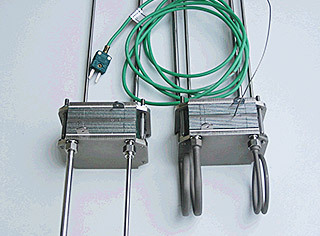 The center bipolar plate of UBOCELL SOFC Mini-Stacks has electrically insulated bores for insertion of 1 mm thermocouples (left). Four or eight electrically heated bipolar plates may be installed by request (right). The temperature at the geometric center of the stack can be precisely controlled during start-up and operation. This is a unique feature of the UBOCELL SOFC technology of ALMUS System AG. 16 anode-supported cells per stack and etched Crofer 22 H bipolar plates. Open circuit voltage: about 17 VDC. Footprint area: 60 x 60 mm2, active area per cell: 27 cm2. Weight: 0.7 kg. Recommended operating voltage: 12 VDC. Power output at 700°C: up to 100 Watts with hydrogen and air. Air and fuel connectors are supplied. 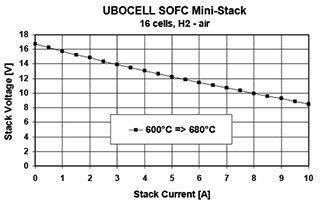 UBOCELL SOFC Mini-Stacks are sold fully operational with reduced anodes. Supply tubes and electrically heated bipolar plates are optional. Products of ALMUS System AG satisfy relevant standards. As the technology is still under development, no formal guarantee can be given. However, ALMUS System AG is prepared to receive comments and complaints from customers and will swiftly provide advice or replacements in case of serious technical defects.